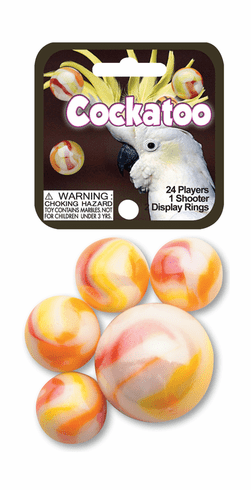 Flamboyantly colored, these marbles suit the player of aggressive, flashy marble playing. Draw a 10 foot circle with chalk, and place 13 marbles in an "X" shape in the center. The marbles should be about 3 inches apart. Knuckle down outside the line and shoot at the marbles inside the ring. The first player to knock seven marbles out the ring wins the game.